The treatment of many thyroid disease entities remains total thyroidectomy. Although we have successfully performed near total thyroidectomy using an endoscopic transaxillary approach, use of this technique to perform total thyroidectomy has been challenging. 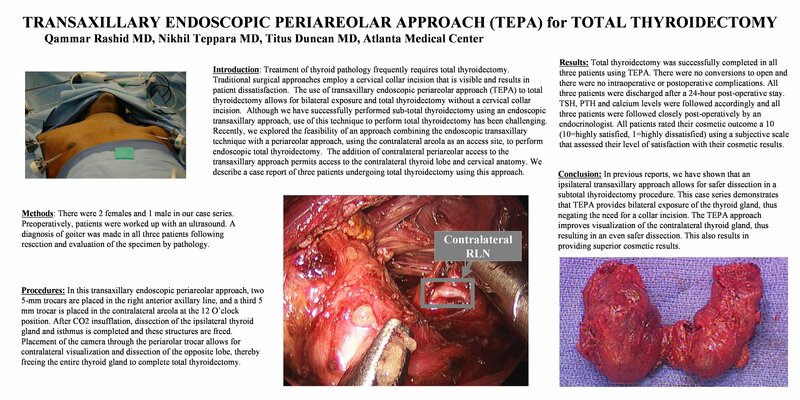 We recently explored the feasibility of an approach combining the endoscopic transaxillary technique with a periareolar approach, using the contralateral areola as an access site, to perform endoscopic total thyroidectomy (Transaxillary Endoscopic Periareolar Approach – TEPA). The addition of contralateral periareolar access to the transaxillary approach permits access to the contralateral thyroid lobe and cervical anatomy. We describe a case report of three patients undergoing total thyroidectomy using this approach. In this TEPA approach, two 5-mm trocars are placed in the right anterior axillary line, and a third 5 mm trocar is placed in the contralateral areola at the 12 O’clock position. After CO2 insufflation dissection of the ipsilateral thyroid gland and isthmus is completed and these structures are freed. Placement of the camera through the periarolar trocar allows contralateral visualization and dissection of the opposite lobe thereby freeing the entire thyroid gland to complete total thyroidectomy. Total thyroidectomy was successfully completed in all three patients using this TEPA approach. There were no conversions to open and there were no intraoperative or postoperative complications. All patients rated their cosmetic outcome a 10 (10=highly satisfied, 1=highly dissatisfied) using a subjective scale that assessed their level of satisfaction with their cosmetic results. In our hands, a pure ipsilateral transaxillary approach to the thyroid limits our ability to safely perform total thyroidectomy using a pure endoscopic ipsilateral approach. This case report shows that total thyroidectomy can be performed using this TEPA approach. We conclude that further study of this technique should be performed to assess its feasibility as a tool in the approach to patients needing total thyroidectomy.